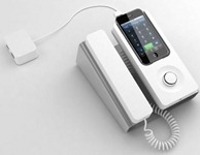 Turn your iPhone into a regular desk phone with the iPhone Desk Dock Phone, where you get a wired handset to boot. This is definitely the tool to have if you want to introduce something more retro to your home or office, letting you make and receive calls in the old fashioned manner while making sure your iPhone remains charged to the hilt whenever it is docked. Other features include a couple of stereo speakers, a microphone, volume control, instant mute as well as a choice between USB or AC for its power. Guess the iPhone just got a wee bit smarter, eh? You posted this on foolishgadgets.com couple weeks ago and now here? didnt understand….its not very useful but is a good device..its stylish.